I’m using windows 10. I had this issue even after installing Graphviz. The problem was that the Path did not have the graphviz folder where dot.exe resides. I did a search in windows explorer to locate dot.exe and added the folder to the system PATH. I had to restart the machine to have Jupyter kernel use the new path. I run Linux, so the windows 10 solution does not apply to me in this case. This is my first message, first of all thanks for all this great content, @jeremy!! I found very interesting your idea of creating every tree of the RF with a subsample of the original training data. I tried that approach using set_rf_samples and it made sense that it should take more or less the same time as training the RF with a subset of the data as you said, but it didn’t. I submitted an issue on github about this. I saw that also in your case the same thing happens, taking 539 ms when you train on a subsample of the data and 3.49 s when you use set_rf_samples. Why does this happen? Regarding proc_df(): When I look to the source code of proc_df, it looks to me that the data is randomly selected and not the first N rows are choosen. So therefore this set will overlap with the validation set in the provided jupyter notebook, right? Second: I think I remember you said that set_rf_sampes cannot be used in combination with oob_scores=True. But in the provided notebook it is used in that way!?! This solution was recommended on the graphviz github issues page. Work on Mac as well. I have been having an issue on Paperspace with the P5000 GPU instance with the notebook kernel crashing as soon as I try to load the data in ML lesson 1 or 2. Does this guarantee that the validation set will not intersect with the training set considering that the validation set has size 12,000 > 10,000 , the number of items we discard here? Now, proc_df() extracts first 30000 rows instead of randomly shuffling. I think it should look good !! So, to decide which variable to split in random forest tree, do we consider the variable with the highest correlation value with the value ? 276 self.source = source #: The verbatim DOT source code string. A bit late but I am using the house prices data set. It’s for training if you don’t have much experience though I have to say with all these techniques I am slightly below 50%. I suppose it doesn’t always place you in the top 100. When you were going through the lesson for the students in the class, I suppose the dataset was already date sorted and that is the reason why you did not explicitly sort it. But for us, who download the dataset from Kaggle, we should sort it, right? 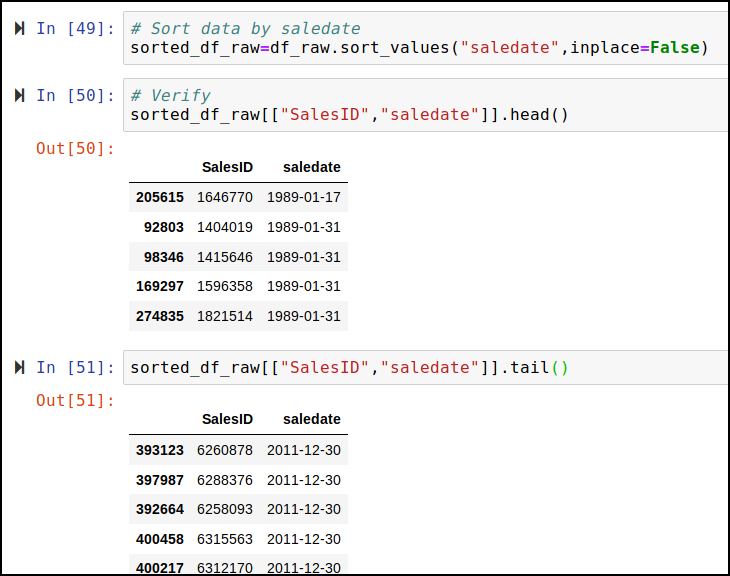 I took a look at df_raw.saleYear.head() output after the add_datepart(df_raw, 'saledate') was executed and see that the date is not sorted. 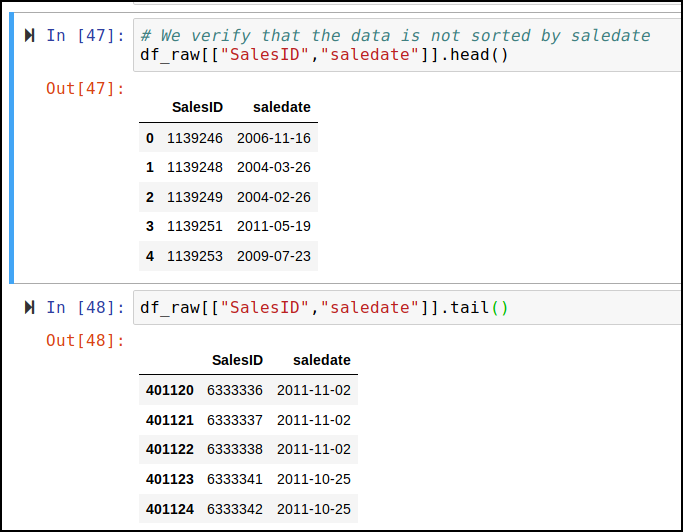 Ideally the dataset should be sorted by saledate, right? Yes, it should in order to reflect the distribution of the validation set. Here is an example of how to sort (there may be a better one).